As I write this review, I am on the lookout for a new night vision device to take with me on a safari holiday that I am going on in a few weeks time. 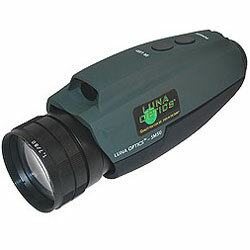 So it is with great interest that I take a look at this 5x night vision monocular from Luna Optics, the LN-SM50. Just like their LN-SX3 night vision monocular that I have already reviewed, the main advantages of this monocular over a night vision binocular like the Luna Optics LN-PB3 is the fact that they are a lot cheaper and more compact - which for me is an important consideration as my bag is already pretty full of kit that I am taking on holiday with me. These NV monoculars come with a duo-tone (green and black) body that has a very thin rubberized finish to them that is pleasant to look at as well as comfortable to hold. On top of the body and easily reachable whilst you are holding the monoculars up to your eyes is the On/Off and Infrared illuminator (IR) buttons. Just behind these are two light indicators that let you know when the device is on and when you have the IR illuminator switched on. On the underside of the body is the battery compartment, accessed with a sliding cover and that which takes 2 x AAA-size batteries that Luna Optics say gives you an operating time of 30 hours. A wrist strap is located on the underside of the body, which will help to make sure you don't damage your equipment, should you accidentally drop it. It works fine, but I really did like video recorder type strap that was on the LN-SX3 and wished that there was something similar on this Luna night vision monocular. The weight of the Luna Optics LN-SM50 night vision monoculars is 670g (1.47lb) which is pretty good considering that this monocular has a fairly powerful 5x magnification and therefore has to use thicker glass than less powerful devices. It also has a really nice large diameter objective lens (80mm) which obviously will weigh more than ones with smaller objectives, but have the advantage of being able to take in more light. Once again considering that they have a nice large 80mm objective lens, their dimensions are fairly compact 182mm x 55mm x 65mm � (7.1" x 2.1" x 2.5") which means that I (I mean you!) should easily be able to pack them away in your hand luggage for traveling with as well as in your day/night pack whist out in the field. 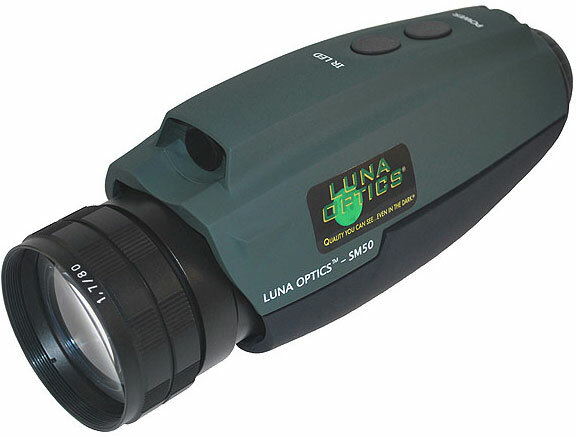 Like all good quality night vision equipment, these Luna monoculars come with a built-in IR illuminator (Infrared illuminator) that is located at the front of the device, just above the objective lens. What this does is enable you to use them whenever there is not enough ambient light to see clearly even even in complete darkness. It is turned on via a button on top of the body and emits and infrared light, which shines onto the object you are viewing and then reflects back to the LN-SM50 and is then amplified by the tube in the same way as ambient light is. The eyecup on the LN-SM50 is made from a tough but fairly soft rubber and feels pretty comfortable even when pressed firmly against your face. Just like most other Luna Optic monoculars, to focus, you just twisting the end of the barrel. To go from near focus to infinity takes almost a full turn, which is a little more than many other devices (often half a turn), but a full turn is not excessive and focusing is fairly quick and the slightly lower gearing has the advantage of making fine tuning your focus that much more accurate. In general, the larger the objective lens, the more light gathering potential of your optics. The down side to larger lenses is that they are more expensive to make and the fact that they will usually make your device both bigger and heavier. What I really like about these Luna SM50 monoculars is that despite the fact that they have a large 80mm objective lens, they are not that much more bigger than compact versions with only 50mm objectives, yet have far more light gathering ability. To make higher magnifications, you need to use thicker glass and this presents a couple of problems, the first is a minor one in that it will increase the weight of your optics, the second however is far more important - the thicker the lenses are, the less light is transmitted through them and this greatly affects night vision products, much more so than the daylight optics and this is why night vision devices tend to have lower magnifications. So in night vision talk, a 5x magnification is fairly powerful and comparing them to the 3x LN-SX3 that I had with me you could notice the difference, so if you are wanting to get closer to the action these would be far more suitable. So because of glass thickness, if all other things were equal, a 5x night vision magnification monocular like these would be less bright than a device with a lower magnification. This is a very important consideration when deciding on what you need. But what Luna Optics have done is to increase the size of the objective lenses on these from 50mm (on the 3x version) to 80mm - this helps preserve image brightness and you also can now get closer to the action. The trade-offs being increased weight and size. Apart from the size of the lens, other factors like the quality of the glass used and their coatings also have a large say as to the quality and how bright the image will be. Luna Optics say that a top-quality objective lens is used that has been multicoated specifically for best light transmission to provide vivid and sharp images. What this means is that at least some air to glass surfaces (usually the first and the last) have multiple layers of antireflection coatings that help to transmit as much light as possible. During my tests I was very impressed with image brightness and they were easily as bright as the smaller LN-SX3 that I compared them to. There was quite a lot of softening of the image around the edge of the view, but no more than any other Gen 1 device that I have used before. I could easily make out all my vegetables at the back of my garden - 120ft away and I must say, that the extra magnification was nice to have and just like all the other Luna Optics devices that I have tested, I was very impress by the almost complete lack of black dots in the view. The built in IR illuminator also works really well and really brightens the view at close to medium distances. It will also enable you to use these monoculars in complete darkness. Not all Gen 1 devices are created equal and you can find quite a large difference in performance. This is because during the manufacturing process all tubes are evaluated and graded according to their quality and performance and are sold at significantly different prices depending on their light amplification and image clarity. This of course is reflected in the final price of the Night Vision device. Whatever available light there is (ambient light from stars, the moon and man made lights etc) reflects from the viewed object, passes through the objective lens of the LN-SM50 night vision monoculars and creates an image of that object on a photo cathode screen, which is located on the front of an Electronic Intensifier Tube inside them. These night vision monoculars have a really good viewing distance of 300m (978ft) which compares very well with other monoculars in this price range (see table below). The field of view for the Luna Optics SM50 is 9°(475ft at 1000 yards) - which is slightly less than devices with a lower magnification (as magnification increases, field of view usually decreases) but this should still be adequate for most peoples needs. The minimum close focusing distance is 2m (6.6ft), which is very good, making these a good choice if you want to view objects up close at night. I thought it would be interesting as well as informative to compare the stats of the Luna LN-SM50 and LN-SX3 and night vision monoculars, the Luna LN-PB3 binoculars and another popular entry level device, the Bushnell 2.5x42 Night Vision Monoculars. Like all the other night vision devices that I tested from Luna Optics, I was really impressed with this LN-SM50. Highlights for me include the fact that you still get what is for a Gen 1 device, a very bright image as well as a fairly powerful 5x magnification. The built in IR illuminator works really well, and I also like the overall feel of quality that you get from the instrument. What was also impressive for me was just how quiet they were - with most Gen 1 night vision devices you get a small high pitched whine whilst they are turned on, which if you are looking at very sensitive wildlife may disturb them. With these SM50's the whine was more of a buzz, and it was far less audible than on most other devices that I have used. Weak points? I am only mentioning this because I was testing the Luna Optics LN-SX3 at the same time and it has a video recorder type hand strap that I really liked, whilst the SM50 only has a simple wrist strap. But overall if you are looking for a very good quality Gen 1 night vision monocular, with a powerful magnification then I have no reservations about recommending these Luna Optics LN-SM50's to you. They will work well for most peoples home security needs, make a fun addition to your camping trips and are ideal for night time wildlife observation and perfect to take with on safari. I personally decided to go on safari with the LN-PB3 Night Vision Binoculars, even though they are more expensive, larger and heavier than these monoculars. The main reasons being that I just prefer the way a binocular feels against your face and what really swung it for me was when I added the LN-ELIR-1 laser illuminator to the binoculars - it is a rather expensive accessory, but it does make a big difference to your vision at night. Without the extra laser illuminator, the decision would have been much more difficult and would probably go down to budget and the amount of space left in my bag.